Hamas militants painted murals of abducted Israel Defense Forces soldier Gilad Shalit and missing Israel Air Force navigator Ron Arad Wednesday night in the Jabalyah refugee camp in the Gaza Strip. 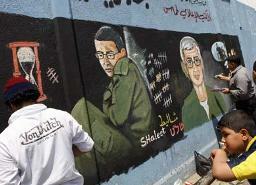 The graffiti portrays Shalit as he looks in 2009 next to a mock-up of how the soldier will look after another 30 years in captivity, his hair grey and his face beset by wrinkles. The murals were painted during a demonstration held to mark Prisoners' Day, presumably in a bid to tilt Israeli public opinion in favor of a prisoner exchange with Hamas. During a rally held four months ago to mark the 21st anniversary of the founding of Hamas, the Islamic group performed a skit where an operative dressed in an IDF uniform mimicked Shalit, portraying the soldier complaining in Hebrew about how he "misses mommy and daddy."